“Awards can give you a tremendous amount of encouragement to keep getting better, no matter how young or old you are”. Recognition and building a following is hard work. But to get it means try, try and try again. One day you’ll strike it. The pleasant surprise comes to your email inbox, and it’s well worth it. In the past month, I am excited to announce that two of my time-lapses were selected for their merit. Firstly, my ‘Footwhistle Cave’ time-lapse of glow worms was selected as the winner in the New Zealand Geographic Photographer of The Year award. The competition came around earlier than I expected. This year was different, as is every other year. It seems there’s no public exhibition this time. A bit of a disappointment given that last year’s was held in the Auckland Museum with back lit images looking so vibrant in the semi-lit gallery and massive flat screen TVs showcasing the time-lapses. Not this year though. The second was my ‘Auckland: Outside Inversed’ camera obscura project. This received an Honorable Mention in the IPA International Photographers Awards. Check them out below. I’m pleased to present a number of my favorite landscape images for a 2019 calendar. 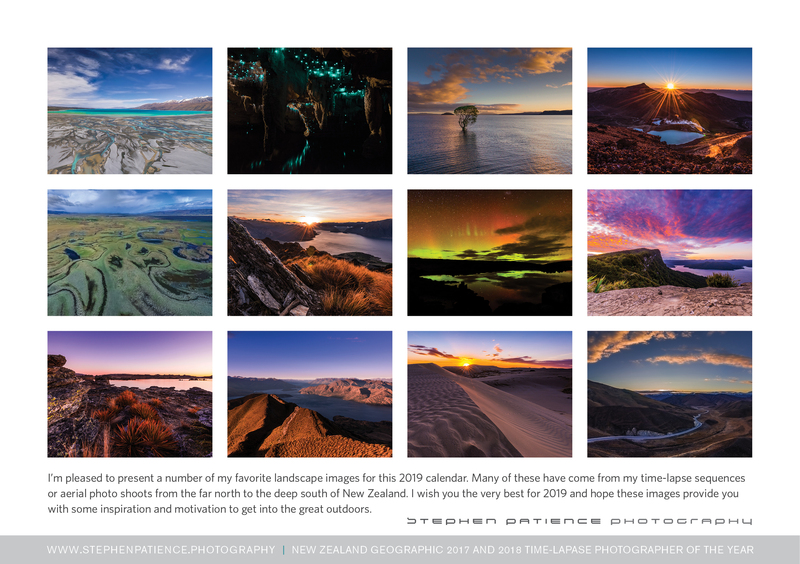 Many of these have come from my time-lapse sequences or aerial photo shoots from the far north to the deep south of New Zealand. While I haven’t done a calendar for a few years now, I thought I’d do another with a calendar case like last time. Only this time, it will be a little bigger in size A5. I hope you like the selection. Let me know if you like one.